The web hosting market is fierce and competitive, which is why a web hosting provider’s reputation is critical to their success. There are hundreds – maybe thousands – of web hosts out there, but only a select few have survived and managed to last for over a decade. One of the veterans in this industry is a web hosting company called MyHosting. Whenever I review a web host, I look into their plans, features and pricing. I want to make sure they have everything to get a site up and running; and whether or not they’re worth a person’s investment. I compared them to other top brands, and then I look at their uptime and reliability. And of course, let’s not forget customer support. MyHosting was established way back 1997, and is known for being one of the first to offer budget-friendly web hosting services to clients worldwide. Headquartered in Toronto, Canada, the company stands by its mission to provide quality yet affordable web hosting products and services that effectively uses the most cutting-edge Internet technologies. They have partnered with some of the best and biggest names in the industry, including Cisco, Microsoft, Dell, Intel, and many more. Today, MyHosting claims to have over 50,000 clients from more than 200 different countries. They are an award-winning company that has received several award in the past few years, including Best Affordable Web Hosting and Best VPS Hosting, among many others. The company also claims to have a team of experts with years of experience working in the web hosting industry. Besides web hosting, MyHosting also operates a web-based email retrieval system, as well as domain registration. MyHosting offers a wide variety of web hosting packages to help their clients be successful online. This includes shared web hosting and VPS hosting. Their plans are tailored for individuals and small- to medium-sized businesses, including eCommerce. All their hosting plans are backed up with 100% uptime and a 30-day money-back guarantee. What’s more, you can choose between a Linux-based server and a Windows-based server, so you can use specific programming languages, scripts, and applications for your website. MyHosting provides three different shared hosting plans: Personal Website, Business, and eCommerce. that allow you to easily create and manage a simple yet fully functional website or blog. These plans come packed with the necessary tools and services to get your site up and running fast. You can choose to pay monthly or annually. However, the price gets cheaper the longer you stay with MyHosting. At the time of writing, MyHosting is even offering discounts on all their shared web hosting plans, whether you choose to purchase on multi-month or multi-year terms. What’s more, they also offer a special promo that doesn’t require a coupon code. For new account holders, MyHosting will top up their offer with a promotional FREE domain name for the first term of service. With this, you’ll get to save $14.95 for the first year. And if that’s not enough, you can get even more savings simply by using the promo code MYHOSTINGDISCOUNT to get an extra 25% off on regular prices. The basic shared hosting plan, Personal Website, is currently at $4.95 a month (regularly $7.95 a month). It’s only available on the Linux CentOS platform, and is ideal for those who wish to build simple personal sites, blogs, photo galleries, or file storage. Unlike other basic hosting plans that impose limits on features and resources, MyHosting’s basic hosting plan already comes packed with unlimited disk space, bandwidth, and domain hosting. It also includes 2 basic email bundles, 3 MySQL and PostgreSQL databases, and 1 FTP account. On top of these, you’ll also get a FREE website builder (SiteBuilder), FREE Yahoo!/Bing search ad credit, FREE Vanity SSL Certificate, and FREE eCommerce add-on that lets you add a shopping cart on your website. At only $9.95 per month (regularly $14.95 per month), you can get MyHosting’s Business hosting plan, which is a full-featured package that’s ideal for growing business sites. It builds on the Personal Website plan, except that you’ll get a FREE Linux account plus Windows hosting. It also includes a FREE dedicated IP address, 4 basic email bundles, 5 MySQL and PostgreSQL databases, and 4 web-based SiteBuilder accounts (2 for Linux and 2 for Windows). Looking to propel your business to the next level? Consider signing up for MyHosting’s eCommerce Hosting Plan. At just $18.95 a month (regularly $29.95 per month), this hosting package is best suited for established websites that require features and resources for setting up an online store, complete with eCommerce tools and services, advanced web applications, SEO, and more. Just like the Business hosting plan, it’s built on the Windows and Linux platforms, except that there’s more room to grow your site. With it, you’ll get 10 basic email bundles, 10 MySQL and PostfreSQL databases, 5 FTP accounts, 6 online SiteBuilder accounts (3 for Linux and 3 for Windows), and more tools and apps to further expand your eCommerce site. MyHosting will also throw in a FREE Premium eCommerce Shopping Cart with Starter License, as well as FREE RapidSSL Certificates into the package. 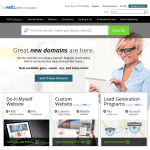 And instead of just one domain name, you’ll get 2 domain names for FREE. Talk about eCommerce-ready! Their offerings are quite tempting, especially when they’re offering “unlimited hosting” in terms of disk space, bandwidth, and domain hosting. But remember: The devil’s in the details! You must carefully read the fine print regarding “unlimited” hosting resources because there are, in fact, significant restrictions on the amount of resources that you can use with each plan. What’s more, the number of email accounts that you’ll receive is quite limited, as compared to other web hosts like BlueHost, which offer unlimited email accounts on their high-tier shared hosting plans. 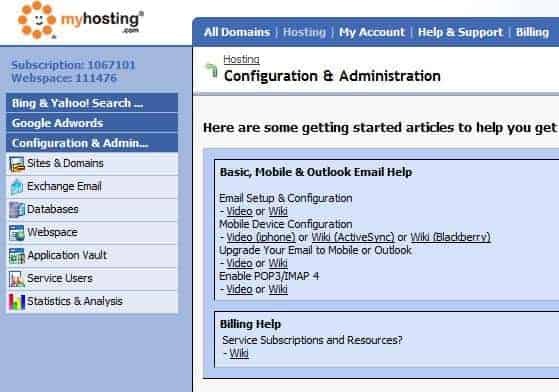 In addition, MyHosting’s shared web hosting plans use their in-house web-based control panel, but their VPS plans use cPanel/WHM for the Linux platform and Plesk for the Windows platform. I’m going to talk about these control panels in great detail later on. Granted that their Personal Website hosting plan is cheap, the two other plans are more expensive by a few dimes compared to other popular web hosting providers (even when the limited-time discount is already applied). So before you decide to settle with MyHosting, make sure to do your homework first and compare them with other budget web hosts. Besides shared web hosting plans, MyHosting also offer a number of different VPS hosting plans, which is where they truly shine. Their VPS plans are dynamic and they are no doubt one of the very few web hosts that offer a lot of different plans for website owners and web developers to choose from. What’s more, the prices are right on-part with other big-name brands like iPage and eHost. With a VPS, you can command and customize your own server environment as if you had your own dedicated server. Better yet, you’ll get the dedicated server resources you need at a fraction of the cost! MyHosting even lets you choose between Linux Hosting and Windows Hosting, and you’ll get your fair share of hardware and network connections while providing dedicated privacy, flexibility, and performance. And since everything about your virtual server can easily be upgraded, there’s no limit to your site’s growth so you can meet the demands of your customers with confidence. The Linux OS is the most popular choice for web hosting because it’s an open source program that’s very affordable and is conducive for running other powerful open source applications like MySQL databases, WordPress, Drupal, Joomla, and more. With these apps at your fingertips, you can easily build, design, and host a full-blown website. MyHosting’s Linux VPS plans are packed with all the right features and tools, but if you compare it to VPS plans offered by other web hosts, you’ll notice that they offer less disk space and bandwidth, as well as memory. For example, MyHosting’s pricing is almost on-par with BlueHost’s, but BlueHost up to 4 TB worth of bandwidth and up to 8 GB RAM. On the upside, MyHosting gives you a wide choice of control panels to use. Most of us, however, would go for the user-friendly cPanel control panel, but this is only available for free on their Linux reseller plan. If you prefer using this control panel, you’ll have to go for their Custom plan and shell out an extra $10.75. 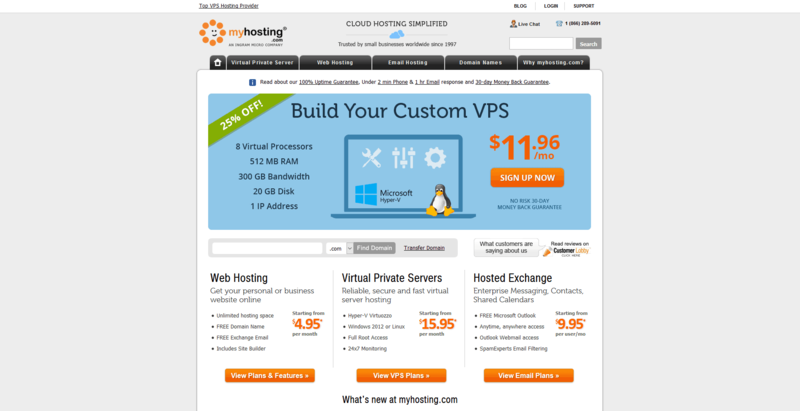 MyHosting is one of the very few web hosts that offer Windows hosting on their VPS plans. You can choose between two plans. One is based on the Windows Server 2008 R2, while the other one uses the more up-to-date software, Windows 2012. [Insert 2012] If you want the latest Windows development and frameworks, then a Windows 2012 virtual server is ideal for you. With a Windows 2012 plan, you can use more cutting-edge applications and take advantage of new tools and cloud features. For the geeks in the audience, you can go all-out and play around with this new OS. Now’s the perfect time to upgrade your skills and get familiar with Windows 2012. Besides these, your Windows-based VPS server will also include full root access (SSH), 1 vCPU, 1 GB guaranteed RAM, 40 GB guarantee storage space, 300 GB worth of monthly data transfers, 1 FREE IP address, and disaster recovery backups. Just like their Linux VPS plans, MyHosting imposed limitations on the amount of storage space, bandwidth, and RAM you’ll get. But earlier, I mentioned that MyHosting’s VPS plans are very dynamic. This means that you can build your own custom VPS package however you see fit. You can even choose between cPanel/WHM or Plesk for your control panel (althought Windows hosting is limited to just Plesk), as well as customize your disk space, bandwidth, RAM, IP addresses, etc. The extra monthly cost will depend on how many resources/extras you’ll add to your plan. We all know that WordPress is the best and most popular open source blogging platform and content management system (CMS) in the market. It’s built on MySQL and PHP and comes packed with a cross-blog tool, password-protected posts, importing, multi-author capabilities, and bookmarklets, among others. Unfortunately, MyHosting doesn’t offer managed WordPress hosting plans, although a WordPress auto-install feature is included with all of their web hosting plans. With their one-click application installer, you can quickly and easily install the latest version of this popular open source application. You don’t even have to be a coding wizard to be able to use this indispensable tool! MyHosting Control Panels – Choose What’s Best for You! MyHosting has a whole host of user-friendly control panels that you can use for managing your hosting account. MyHosting have decided to develop an in-house web-based control panel exclusively for their clients. They’ve partnered with Parallels to develop this custom panel, allowing you to manage all aspects of your hosting account, including domain name registrations, emails, billing, and more – all in a single, straightforward interface. 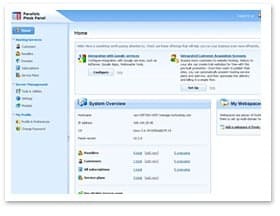 The control panel is included tailored to complement the features and tools of their hosting plans, and is perfect for those who have opted for their shared hosting plans (although it’s included with all of their web hosting plans for FREE) and those who want a simple and fuss-free control panel. Besides these, the main page of the web-based control panel is filled with Help pages and guides that newbies will find handy. Underneath, there’s a list of many other helpful resources that allows you to control every aspect of your site with ease. 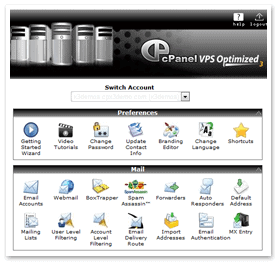 cPanel is no doubt the most popular web administration panel in the industry, and is offered by various web hosts for both their shared web hosting and VPS hosting packages. A lot of users loves it for its simplicity and ease of use. It’s also the most common choice for PHP-based sites, and is used as a front-end. MyHosting provide their clients the option to use cPanel in their Linux-based VPS hosting plans, as it’s the best choice for running Apache and MySQL. It comes with a whole plethora of helpful and intuitive features and tools, as well as dozens of auto-installers for popular applications like WordPress, Drupal, Joomla, etc. So if you want to make website building fast and painless, it’s best to go for cPanel. It’s available for free on MyHosting’s Linux VPS Reseller plan, although you need to pay an additional cost if you go for their Personal Website plan. Also designed by Parallels, Plesk is the most commonly used server management tools for Windows hosting. It’s slightly more complex than cPanel, so there’s a little bit of learning curve. However, it’s somewhat more flexible in terms of customization and configuration. You can manage databases, modify files and FTP accounts, and monitor server logs – all without the complex processes characteristic of other control panels. MyHosting’s Plesk panel has a simple and clean interface, which I appreciate since it lessens the complexity that’s often associated with this type of control panel. MyHosting make it simple and accessible even for those who are completely new to web hosting. The Plesk panel is available in MyHosting’s VPS Windows hosting plans, and is perfect for their reseller plan. It’s just like cPanel in that it has a large customer base and has a rich support community and app ecosystem that makes website creation a breeze. 100% Uptime Track Guarantee – How True Is This? MyHosting claims to have a 100% uptime guarantee, though they don’t cover predictable and scheduled downtime. Based on my personal experience, no web host – even the best of the best – managed to provide 100% uptime to their clients. But that doesn’t mean MyHosting fails to deliver in terms of reliability and performance. As I scoured the Web, I didn’t find a lot of complaints that indicate they have downtime issues. Of course, there are some customers who complained about sudden outages, but that’s inevitable. Overall, MyHosting have high reliability standards, with a pretty decent uptime that ensures your website will always be available and accessible to your customers and visitors. And in the case of disruption, they provide a 1-to-1 credit. So for every hour that MyHosting fail to live up to their guarantee, they provide clients with a full-day credit. This sounds a lot more like a marketing gimmick and doesn’t give much in the way of compensation but it’s pretty impressive. It only demonstrates how confident they are with their services. Again, it’s better to go with a web host that has a solid uptime track record, and MyHosting worked exactly as expected. Customer satisfaction is a top priority at MyHosting, and they definitely put their money where their mouth is by providing a risk-free, no-hassle 30-day money-back guarantee. So if you’re not completely satisfied with their services within the first 30 days of activating your hosting account, you can just submit a cancellation directly from the control panel and request for a refund. You’ll then be given a full refund for any hosting fees charges – no questions asked. There are a few things you should remember with MyHosting’s refund policy. Take note that if you terminate the service beyond the initial 30-day period, regardless of the length of the contract, MyHosting will not refund the remaining hosting fees. 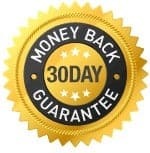 What’s more, if you have a received a refund in the past, or have been a client in the past 90 days, you will no longer be eligible for the money-back guarantee. In the past, a lot of customers complained about MyHosting’s customer support. However, it seems to have improved significantly over the years. They offer support via telephone, email, and live chat. You can also reach them through snail mail if you don’t mind waiting a week for a response. There are occasional grumblings about slow response and long wait times, but you’ll probably find the odd complaint about any web host. The fact that there aren’t a lot of complaints around the Web regarding MyHosting’s customer support indicate that they don’t have any major issues, and I see this as a positive sign. And unlike other web hosting providers, MyHosting give a 2-minute phone response and 1-hour email response guarantee for all support requests. I like this a lot, and it’s faster than many other web hosts I’ve tried. For those who require quick help, MyHosting also have a support-oriented blog and community forums in their website. Here, you can find answers to frequently asked questions, as well as a few helpful information from some of MyHosting’s clients. MyHosting offer pretty decent plans and features at reasonable prices. I wasn’t so keen about their in-house web-based control panel, because it’s somewhat limited in features and resources. What’s more, they’ve chosen to use it for their shared hosting packages, instead of the usual cPanel / Plesk options. The reliability of their services are fair and from what I’ve seen around the Web, they are quite popular and are trusted by many people. Overall, MyHosting is a good choice for those who are looking for simplicity in a web hosting plan. But for experienced customers who want more advanced features and tools, this web host might not be for you. That being said, the number of complaints from customers are limited, so I see this as a good sign. MyHosting is an excellent choice if you’re looking for a budget-friendly shared or VPS hosting plan. They may not be the cheapest in the market, but their plans come packed with just the right tools to get you started.